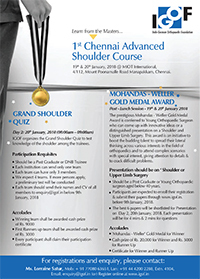 We welcome you to the IGOF’s “1st Chennai Advanced Shoulder Course” – an exclusive meeting on shoulder surgery, to be held on Jan 19th& 20th, 2018 at MIOT International. I congratulate Dr. Ram Chidambaram – Course Chairman and President, Shoulder & Elbow Society of India (SESI) on conceiving this course. 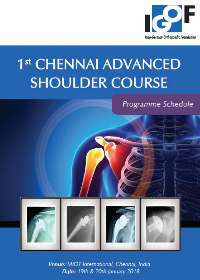 This marks the first region specific meeting on shoulder problems in Chennai. We will provide great opportunities to interact with both our esteemed international and national faculty. We aim to cover the entire spectrum of shoulder surgery, which includes shoulder arthroscopy, arthroplasty, trauma and tumors in two days. We look forward to welcoming you at MIOT International. 9.4) Resurfacing – is there still a role? 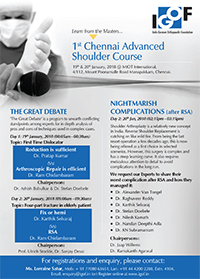 IGOF Advanced Shoulder Course 19th & 20th January 2018 @ MIOT International Chennai. Registration is Mandatory for all above category. Complete the registration form with all the required details. Upon submitting your registration form, you will be redirected to a secured HDFC online payment gateway page for online payment. This applies only for Medical Practitioners. Please complete the payment using your credit/debit card. Fill all the required details in the registration form. 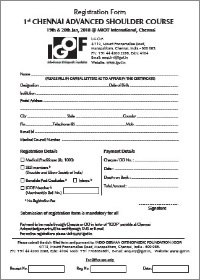 Upon completing the form include the payment a) Cheque or b) DD in favour of ““IGOF”” payable at Chennai. Registration Fee: Medical Practitioner (Rs.1,000), SESI (Shoulder and Elbow Society of India) members (No Fee), Bonafide Post Graduates (No Fee), Interns (No Fee), IGOF members (No Fee). Mail the duly filled registration form and payment to, IGOF – INDO GERMAN ORTHOPAEDIC FOUNDATION 4/112, Mount Poonamallee Road, Manapakkam, Chennai, India – 600 089. Tel: +91 44 4200 2288, Extn: 4104. “The Great Debate” is a program to unearth conflicting standpoints among experts for in depth analysis of pros and cons of techniques used in complex cases. Shoulder Arthroplasty is a relatively new concept in India. Reverse Shoulder Replacement is catching on like wild fire. From being the last resort operation a few decades ago, this is now being offered as a first choice in selected scenerios. However, this surgery is complex and has a steep learning curve. It also requires meticulous attention to detail to avoid complications in the long run. IGOF organizes the Grand Shoulder Quiz to test knowledge of the shoulder among the trainees. Each team should send their names and CV of all members to enquiry@igof.in before 9th January, 2018. The prestigious Mohandas – Weller Gold Medal Award is conferred to Young Orthopaedic Surgeon who can come up with innovative ideas or a distinguished presentation on a Shoulder or Upper Limb surgery. This award is an initiative to boost the budding talent to spread their lateral thinking across various interests in the field of orthopaedics and to attend complex scenarios with special interest, giving attention to details & to crack difficult problems. Should be a Post Graduate or Young Orthopaedic surgeon aged below 40 years. Participants are expected to enroll their registration & submit their papers through the below link “Submit your Paper”. All submissions should be received latest by 9th January, 2018. The best 6 posters will be shortlisted for Presentation on 20th January, 2018 between 01:35pm to 02:15pm. Each presentation will be for 4 mins & 2 mins for questions. © 2019 IGOF. All Rights Reserved.